Dr Mike Woodward grew up in a Christian home, coming to a personal faith at a young age. Following his undergraduate days he stayed in academia teaching at both Loughborough and Staffs Universities and finally moving to work in industry. He is married to Denise and they have 3 married sons and two grandchildren. 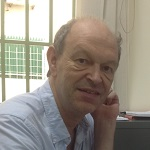 He and Denise spent three years working with OMF in Cambodia and maintain a keen interest in all things overseas.